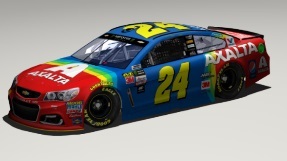 This Is Jeff Gordon's 2015 Rainbow Car, But On The New Beta Mod. Credits: Temp. Splash N Go Graphics, Render: themodsquad Base: Stunod, Logos: Google. I will add a pic soon...do you happen to know any renderers that will render the car for me so i can add a pic?